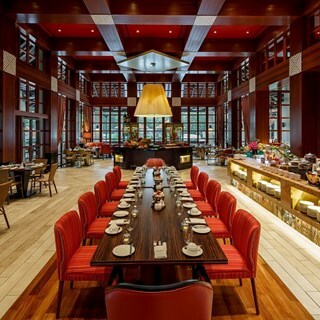 Kwee Zeen presents an interactive dining experience, whisking you on a culinary journey around the world with a sumptuous assortment of Pan-Asian specialties and classic French fare. Enjoy Sundays as they should be with our Magnifique Sunday Champagne Brunch with an unbeatable selection of 16 different culinary ateliers including Live Seafood, Gallery of Foie Gras, a delightful array of handcrafted Truffles from Chocolaterie and more! The luxurious restaurant is helmed by Executive Chef Eric Crochetière who brings 26 years of valuable culinary experience to the table. The menu had strawberry skewers with the chocolate fountain but there was none. My Son was excited for that and was disappointed. French fries and nuggets on kids buffet kept on running out and was not refilled promptly. Best if kids corner was somewhere indoor. It was too hot. Not enough eggs for the egg hunt. A great experience, especially for seafood lovers such as us. That said, the soft drinks option is significantly over priced. Great food. As we went there for theEaster brunch the restaurant was more packed than usual. 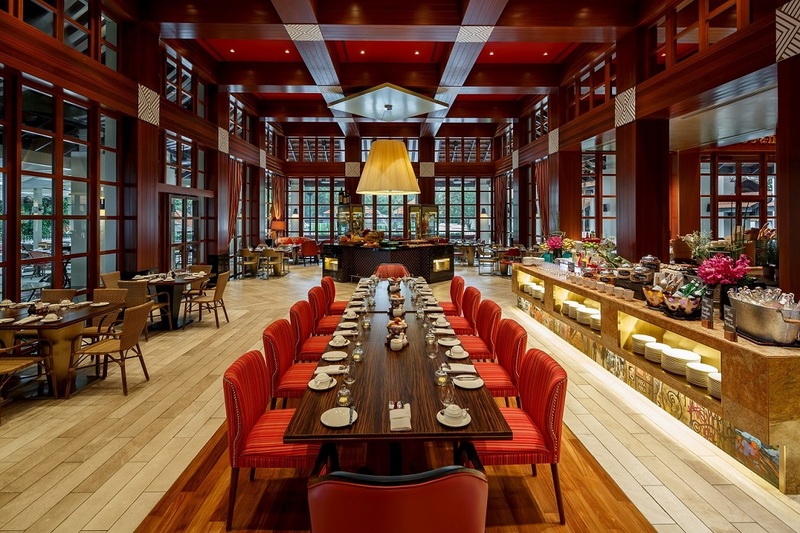 I have been to the Kwee Zeen brunch over 10 times over the past 5 years in a Singapore. This is by far the best brunch activity in the island. 1. The number of customers was far too high for the amount of staff - as a result, the service was suboptimal and we needed to request top-ups (which didn’t come) and/or took a very long time. 2. The clean plates ran out - again as a result of too many people. Had to wait for replenishment of plates for a long time before being able to get food. 3. The activities for the children were not planned for based on the number of children that attended. The Easter egg hunt left many children without anything, and the announcer had to over index that getting no egg was not bad, it was all about fun. This is a good point, but a lot of children ended up with nothing. 4. Only 1 balloon artist for the children. The queue was more than 45 minutes. The capacity of the ballon making was far less than the demand. As a result, I won’t be joining for Easter Sunday brunches in the future. It was simply less value for money as a result of the volume of people and underplanning based on the volume of customers. I will however join the non Easter Sunday brunches as they are truly the best on the whole island. We had a fantastic champagne brunch. The service was impeccable, from the moment we signed in at the register with Elissa , to the entire afternoon with so many charming and witty staffs who made our  brunch such a pleasant experience. So many names to remember. Thank you sous chef Jennifer for making her rounds and ensuring we ate well. We will be back soon. Fennie, Rudy and Hashim. The setting is beautiful, the food is delicious and the staff are exemplary - we are always welcomed like old friends which is lovely when you live a long way from your home country. We love to spend time in such a warm (literally and metaphorically) environment. Well done (again)! We love the Wonderful Sunday brunch here in Kwee Zeen! Every time we have guests visiting from France or anywhere else we bring them here. A particular thank you to the chef Jennifer who is always so nice with us. Everything is wonderful: food quality, staff behaviour, and the pool to relax after 3 hours of buffet is fantastic!!! We will come back soon ! Thoroughly enjoyed our experience there. The best part about the Sunday brunch was the desserts and chocolates. The roasts were not bad too but the other food is all rotated from the normal breakfast and dinner buffets. Service was lacking and apart from pushing the champagne the waiters did not offer us any other drinks. Other Sunday brunches in the city have much better food, ambience and service. Very good, relax and chic ! Food quality good but variety limited. Selection of food was disappointing but the atmosphere and service were great. With my friend I visited the restaurant on a Sunday evening for dinner. The service is very slow and difficult to communicate with waiters. Food not worth money even there is  half price discount. When I paid bill, the waiter could not figure out how to use the accor voucher. Very bad experience and I will never go again. It was a very great and yummy Bubbly Brunch one of the best we had here in Singapore! Beautiful Location, fantastic service and quality of food outstanding! Food and service was satisfactory. However, service was slow when required. Wait staff clears your plate when you are not done with your food. They are overwhelming when not needed and when service was needed, they are not around. Staff should be trained to ask whether plates can be cleared especially when there’s unfinished food still on the plate. Just a simple etiquette that all wait staff should be trained. Thanks. We love the Sunday Brinch here having been a few times and love bringing our visitors. It’s not too big but still has a great selection of food. Staff are excellent. Only one suggestion make the brunch more obvious on your website as i couldn’t find it when trying to book. the staff who stands at the reception counter was quite rude. When we entered to the restaurant, we were deciding if we wanted to sit inside or outside.. few of us were discussing. He came to me sound unhappy that we didn't inform him. Honestly, we were not sure that time as we were still discussing. His tone sound rude and my friend has given him this feedback on that day because it was not just one time. Great place as usual, been coming here for years and service is still impeccable. Familiar face like Saroj, impressive service from him as he has been doing all these times. Definitely gonna continue coming back!